While there are many reasons to open a position, each with a variable chance of success, ultimately a profitable trade rests on the price when the position is closed, regardless of the reason the trade was entered. 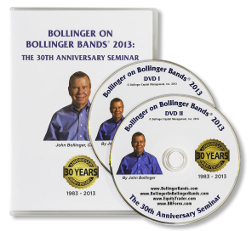 BB-Stops is a system created by John Bollinger to help you to decide when to close a position. BBStops are an adaptation of the stops in Welles Wilder's Parabolic Price Time System. These stops increment both with the passage of time and the progress of the trade. They start at an interval above/below the entry day as a function of Bollinger Envelopes and then progress automatically as time passes and as price changes. If the entry is a buy, BBStops starts beneath the entry at an interval determined by the lower Bollinger Envelope calculation. in the configure tab, enter the date and buy value and activate the plot of the BB-Stop level. The STOP curve will be calculated and plotted on the chart live indicating whether to take your profits or exit and cut your losses. Every day, at the close, the system will recalculate the new stop level and indicate the value (percentage) required until the stop is hit. 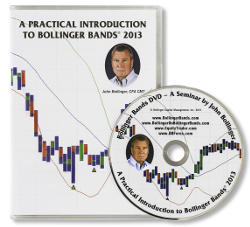 BB-Stops: Simple, powerful, and one of the many useful features included in your Bollinger Bands subscription.